Sentimental is an album by Kathie Lee Gifford, released in 1993. 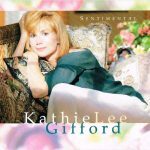 Kathryn Lee Gifford (born Epstein, previously Johnson; born August 16, 1953) is an American television host, singer, songwriter, author, comedian, and actress. She is the co-host, with Hoda Kotb, of The Kathie Lee and Hoda Show, the fourth hour of NBC Today. She is best known for her 15-year run (1985–2000) on the talk show Live! with Regis and Kathie Lee, which she co-hosted with Regis Philbin. She has received 11 Daytime Emmy nominations and won her first Daytime Emmy in 2010 as part of the Today team. Gifford’s first television role had been as Tom Kennedy’s singer/sidekick on the syndicated version of Name That Tune, from 1974 to 1978. She also occasionally appears on the first three hours of Today and is a contributing NBC News correspondent. Produced At – JEN Productions, Inc.